Dekaranger was my first full tokusatsu that I ever saw in its original form. I’d obviously seen Power Rangers before it but once I found out that Super Sentai was a thing and I had looked through the odd episode here and there, Dekaranger was where I got my start. What I’m saying is that I will always be biased when it comes to this series. Even if I’m aware of my rose tinted glasses, it’s hard to take them off. But even then, when I found out that they had made a sort of “reunion” movie I wasn’t really chomping at the bits to get my hands on it. Partly because these sort of things are rarely good. They can be, they just typically aren’t, relying more on nostalgia and old tricks to bring in the viewers rather than actual quality. But also partly because I tried rewatching Dekaranger a while back and… well, it was a bit of a lesson in what rewatching something you remember fondly can do to you. It wasn’t necessarily about the show itself but just… the quality of the video and stuff like that. Quite something. I did see that some people are redoing the subs with Bluray video so I might catch it again then. 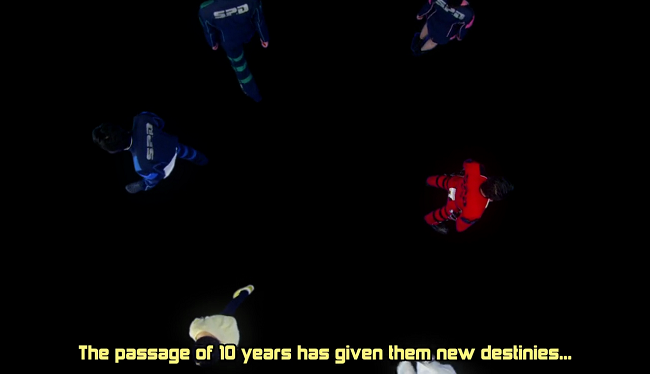 Until then we’re just gonna have to settle for a revived DekaRanger instead. Ten years after serving together on the force, the team we know as the Dekarangers have more or less disbanded. Whether because of transfers or promotion or life getting in the way, the team is no longer what it used to be. And their boss, Doggie Krueger, has been accused of a horrible crime and is awaiting trial. But when tasked to transfer a witness that could condemn their boss to the prosecutor, the team must decide where their loyalties lie. But someone is after the witness and together with two new recruits, the team must fight against this conspiracy with all of their might. 10 Years After is the second movie of this kind, following the Hurricaneger 10 Years After (which I have not seen), and seems to be yet another move from Toei to extend the life of their series beyond their one year run. 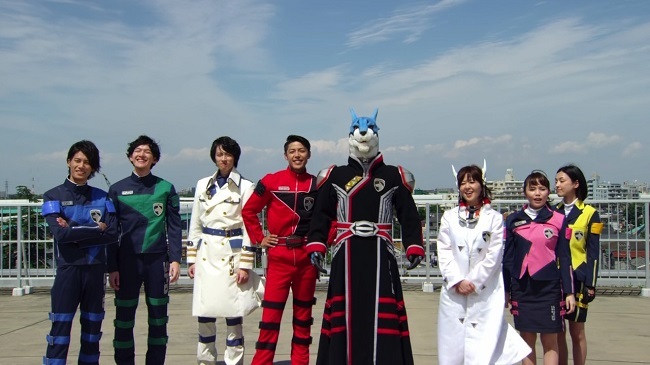 This has been more evident in Kamen Rider, starting with Den-O and Decade, but it definitely seems to be the case now when Dekaranger is coming back not just for this movie but for a crossover with Space Sheriff Gavan in a V-Cinema release this month (June 2017). I can’t wait for that one. If you don’t know what V-Cinema is, it’s basically something between direct-to-video and cinema, not quite has high budget as cinema but not with the bad reputation that direct-to-video/TV/DVD/stream has in the west. Many directors voluntarily choose to work in the V-Cinema field because of the freedom that if often offers compared to stricter cinema or TV rules. Technically V-Cinema is copyrighted to Toei and not really a term used by people in Japan, who instead use the term “original video”, but in the west it’s become a common term. This is how Toei usually follows up on their series after the fact instead of reviving them fully or bringing them back for an expensive movie. And it… works. In the west we’d probably scoff at this sort of thing but in Japan it’s… actually appreciated. And I like it. It gives them a cheaper and more direct route to the customer to continue what is already there instead of having to ditch it completely in favor of next year’s series. But enough exposition, what about the movie itself? Well… it’s kind of… meh. It really suffers from what I mentioned earlier, what I expected from my memory didn’t really match what we got. The characters were kind of… off, trying a little too hard to recapture the exact same feel as in the series but just… missing the mark in some occasions. It also kind of ignores that ten years have passed, people change and evolve and mature but here they play it like they haven’t aged a day. In fairness, this is a point of the series, this wanting things to be as they were forever and ever. The driving force behind the movie, kind of, is Umeko, DekaPink, who often wonder if their time has simply passed and if it’s time to move on and leave space for the new generation. She and Sen-chan, DekaGreen, are the only two left doing the same thing they did ten years ago while training two new recruits. But just bringing it up isn’t enough if you don’t actually do something with it. Which they don’t. They try to have something deep to say at the end but their way of getting there is really shallow and… obvious. The twist is super obvious and one of the glaring flaws of just introducing a handful of new characters: when it comes time to guess who the bad guy is, you only have a few to select from. Now, in a serious production they could introduce a few new characters and cast doubt on who it would be as well as put some doubt in your mind as to the returning characters’ loyalties. 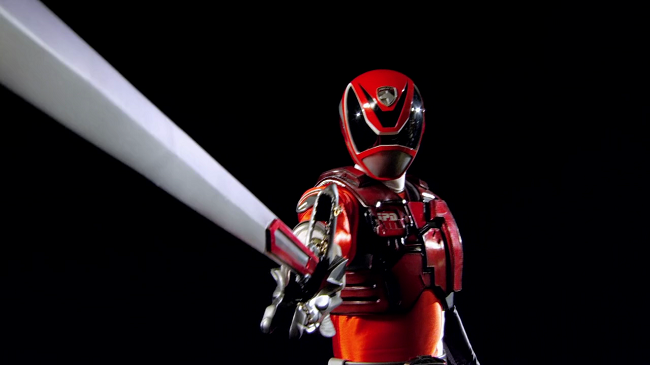 But Toei simply isn’t able to do that. They’re far too scared of even remotely suggesting their heroes are anything but true, honest heroes. And it’s also why the notion that Doggie Krueger would somehow become a criminal never works. 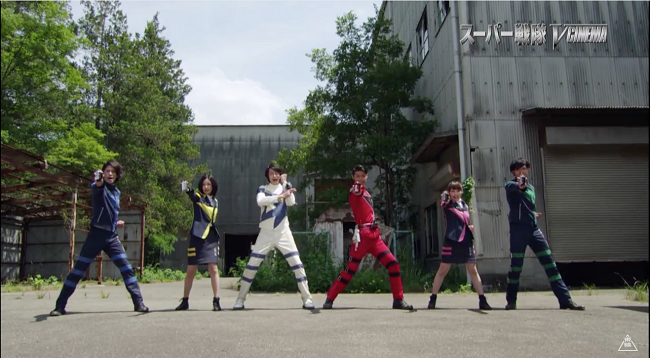 It’s too abrupt a turn that coupled with Super Sentai patterns can’t quite stick. This isn’t even the first time they’ve tried to do this nor is it the first time I’ve complained about them doing it. 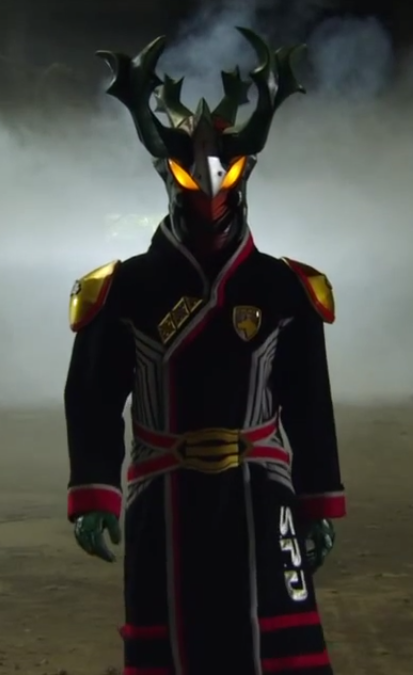 The idea of a good guy turning bad is so alien to the writers at Toei that it’s kind of a joke that they keep trotting out the same old cliche and expect people to swallow it. Sure, kids might buy into it but kids will buy into pretty much anything, it’s not exactly a badge of honor that you can trick kids. I’m not saying you have to make something very dark and horrible and crush the spirit of every man, woman and child nor even to admit the simple truth that adults also watch this. But I am saying that I think kids could handle it. That said, at least this time around they do leave a little trail of breadcrumbs to follow, allowing you to figure out what’s going on before the movie reveals it. There was one key aspect that they left out, which I don’t necessarily like as I want all the pieces to be there, but it was an easy one to figure out anyway so it worked. What I did strongly dislike were the villains as they were never fleshed out even a little bit, never given proper motivations beyond “We’re evil and we like doing evil things.” The main villain’s two underlings went grossly underused and despite holding the key to the most interesting reveals and potential for backstory. It doesn’t help that his two henchmen were really poorly acted. I know they do villain a bit differently in Japan than here but, my God, that was some serious overacting there. Like, if there hadn’t been a roof I’m pretty sure they’d be in Earth’s orbit for how over everything they were. The rest of the acting wasn’t that great either, a lot of it probably coming from the fact that they were all trying to fit into roles they hadn’t taken on for a good ten years and in some cases really had outgrown. The two guiltiest of this was Ryuji Sainei, who plays Ban, and Mika Kikuchi, who plays previously mentioned Umeko. In Ban’s case it’s just a really awful disconnect as the actor has matured so much and no longer looks like the near-delinquent he was in the original series and in Umeko’s case it’s just weird watching a grown woman pretending like she’s a teenager pretending to be a young girl. Tsuyoshi Hayashi, DekaBlue, and Yousuke Itou, previously mentioned DekaGreen, were the only two to really pull off their old characters and much of that, I think, had to do with them actually having grown up a little or at least changed. Hoji, aka DekaBlue, seems to be in a slump ever since his boss was accused of being a criminal and Sen-chan is busy keeping an eye on his girlfriend, Umeko, having grown far more comfortable in that role since we last saw him. Jasmine, DekaYellow, has very little to actually do in the movie and I’m a little disappointed they roped her back in since she was now married and a mother. I’m not saying a woman has to give up her career just because she’s married or a mother (though Japan might disagree) but rather that since the whole point was they can go separate ways but still remain friends and a team, having her put on the uniform again just… sort of disproves that. In my eyes it rather enforces that they’re not allowed to change rather than admitting that things change and that’s okay. It’s okay for Jasmine to leave the force to pursue a family life because they’ll be friends anyway. I dunno, it just really bugged me when she put on her uniform again. Having her appear without her uniform and still morph would’ve been a far stronger message, in my opinion. Like… she’s a mother and a wife but she’ll still come to her friends’ aid while still remaining outside the force. I’ll try and let it go now. Now it sounds like I really disliked this movie… and well, that’s partially true. But it’s really no different from the disappointment I regularly feel from watching these V-Cinema releases. I always feel like they could be better. But it’s a bit more disappointing here because the fighting just isn’t very good. At the very least it should be better than it is in a regular episode but that’s exactly what this feels like: a regular episode, just… longer. They don’t really fill the time with anything good either, it’s like they took a regular episode and stretched until it was so thin you could see through it. I realize they probably just pulled the suits out of storage for this and in some areas you can tell, especially with the big mech that only makes a brief appearance and it definitely looks like it’s taken some beating (or been through a year of filming). And there’s not really anything new to see either, no new mech or any new weapons and the often mentioned new headquarters is just a mediocre CGI construction that never really fills any kind of function. So the fights rely entirely on good stunt work and it just isn’t very interesting stuff. There are some cool shots, like when Ban gets Doggie Krueger’s sword, but there’s not even than many tussles in the movie. Perhaps another holdover from its episodic format, there’s one fight in the beginning, one roughly in the middle and then one at the end and that’s just not enough for 50 minutes. And outside the last one, where the team finally unites, there’s not really anything memorable about them. The one in the beginning is especially forgettable and the one in the middle just kind of… peters out. And I do acknowledge it’s a bit hypocritical of me to complain, considering I said it relied a bit too heavily on nostalgia, but there were parts that I was missing. 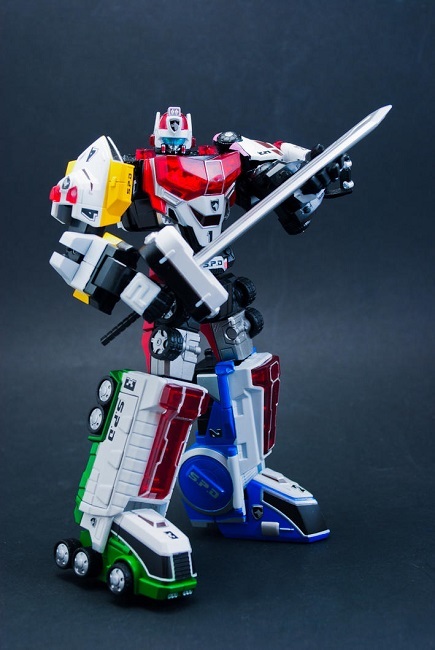 Like I mentioned before, we only got to see the Dekaranger Robo for a brief moment but we didn’t even get to see it assemble or the entire team behind the steering wheel which was a massive letdown. One way they could’ve done it was to have the robo be considered old and antiquated, practically mothballed and then taken out for one last spin, perhaps one where it was even destroyed. But the lack of the Robo was a serious strike against the movie, especially since it’s one of my all time favorites. Say what I can about the series, but that mecha was awesome from beginning to end. Perhaps the suit just wasn’t viable anymore and it would cost too much to create a new one, I can see that as the series is ten years old, but it’s still hugely disappointing. Not to mention it’s a really glaring flaw in the whole “moving on” thing as the robot was just as big a part of the team as the people were. So, did I like the movie? Well, yes and no. As always with productions like these, there’s the side of me that just watches it and gets wrapped up in my feelings for the old series like a warm blanket. And then there’s the other side of me that wants to see them do more. Yes, of course it was fun seeing the cast back together again. The fact that they could get every single member back was impressive on its own since they so easily could’ve just mentioned some of them in passing, especially some of the less important ones like Swan. But it also makes me question what the point of it is. If all you’re doing is reaffirm that they are more or less exactly where they were when we let off last, then why bring them back? Especially if you’re gonna end with the few that have moved on coming back to where they used to be. Maybe this is just one big setup for Space Squad, I don’t know, just kind of getting all the pieces in place. But it still has to stand on its own two legs and I just don’t feel it did. They went way overboard on some nostalgia while completely brushing past other sources of nostalgia. The whole thing has a rushed feel which is weird, you’d think they’d have ten years to plan this but I guess not.